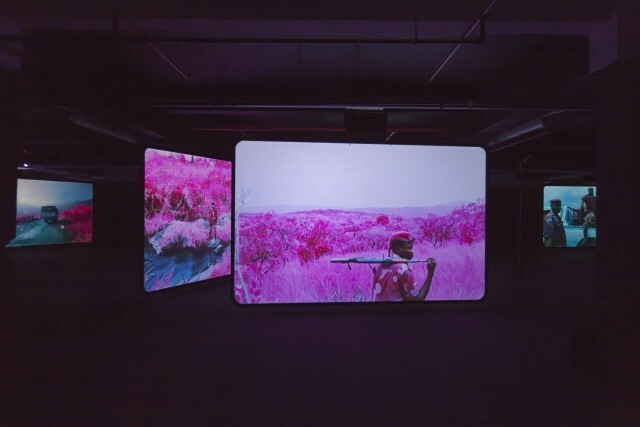 War photography sits uneasily with fine art, but Richard Mosse's new installation at The Vinyl Factory Space in London combines straight reportage with an unworldly technical process. The end result is powerful, both in terms of the real story being told and the way in which the imagery lends an aura of the spectacular and unreal. As a result you are drawn closer into the unknown. The Enclave is ostensibly a work about the conflict in the eastern Democratic Republic of Congo. Created in collaboration with the cinematographer Trevor Tweeten, using 16mm film and lumbering Steadicam equipment, a landscape of great beauty and danger is set out before the viewer. These films are enhanced by a technically advanced soundscape, created by Ben Frost, from field recordings made in North and South Kivu, the heart of the conflict. First shown at the Irish Pavilion at the 55th Venice Biennale, Mosse has expanded and extended the installation for his debut London show with The Vinyl Factory, inside Brewer Street Car Park, which now comprises of an eight-screen video installation, as well as large format photographic panels. For the large scale imagery, Mosse has used Kodak Aerochrome, an infrared film originally developed for aerial reconnaissance during the Second World War (the company describes it as 'sometimes effective when used to photograph objects painted to imitate foliage... in the resulting colour infrared transparency, the areas of healthy deciduous foliage will be magenta or red, and the painted objects may be purple or blue'). The vividly rendered rainforest and vegetation is contrasted with the people in the centre of this ongoing catastrophic conflict, who look as if they have been transplanted onto another planet, displaced from reality. This is, of course, exactly what has happened, with 5.4 million deaths since 1998 and countless displaced communities across the region. Mosse's work also makes the point that unlike other modern conflict zones, the heavily forested landscape seems to absorb all traces of violence, even though the very subjects of his images are the rebel enclaves and refugee camps that exist solely because of the fighting. The video screens bring these environments to uneasy life. Using the same infrared processes, the footage transports us right there, in the heart of these tense and fractured communities, just as much observed by the subjects of the films as we observe them. Of course, there's a self-conscious irony in the use of a military technology to document a conflict zone. Yet the skewed aesthetic not only evokes the complexity of the conflict itself, but also forces us to look with fresh eyes upon an unjustly forgotten part of the world, whose problems and stories have been failed by conventional media.